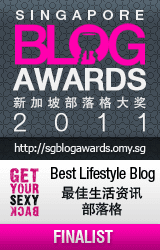 Yesterday, I wrote my first blog of 2010 in Malaysia. Whilst waiting for boyfriend to finish his regular Saturday badminton match with his badminton buddies, I used my boyfriend's brand new laptop to kill some time in the Sports Hall. After some pending blogging intention during the weekdays, accompanied by a can of cold 100 Plus Lemon Lime, I finally wrote something again, my first time blogging whilst in Malaysia. I had some ideas for my blog flying in my head for the past few days but this time around I could not write about the things which I planned to share before. All the photo materials for my planned '2010 blog' were in my laptop in Singapore. Hence, I had to come up with other topic to write here. One I could imagine yesterday afternoon was about the recent and possible ongoing PMS attack I had over the past few days.